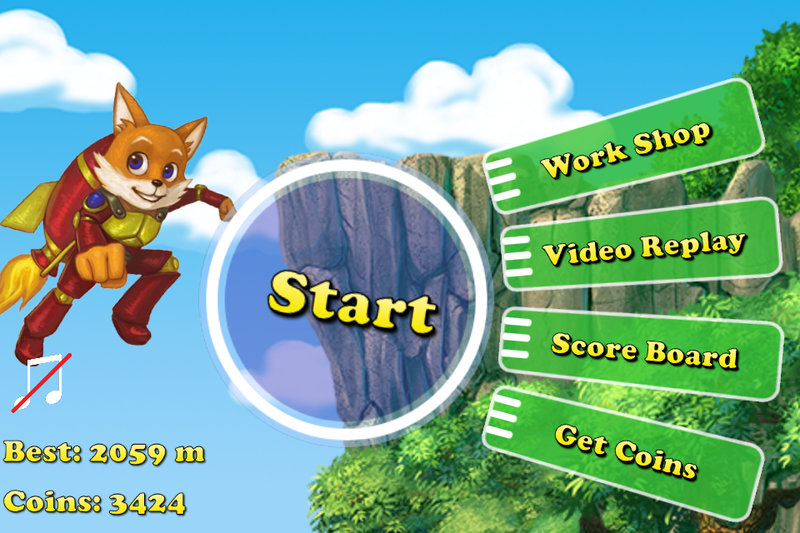 Fox Tales: Rocket Run, developed by Won O Soft, is a competent endless runner that unfortunately fails to stand out. The app store is filled with endless runners, games where the player character constantly moves to the right and the player is tasked with avoiding obstacles for as long as possible, accumulating points along the way. 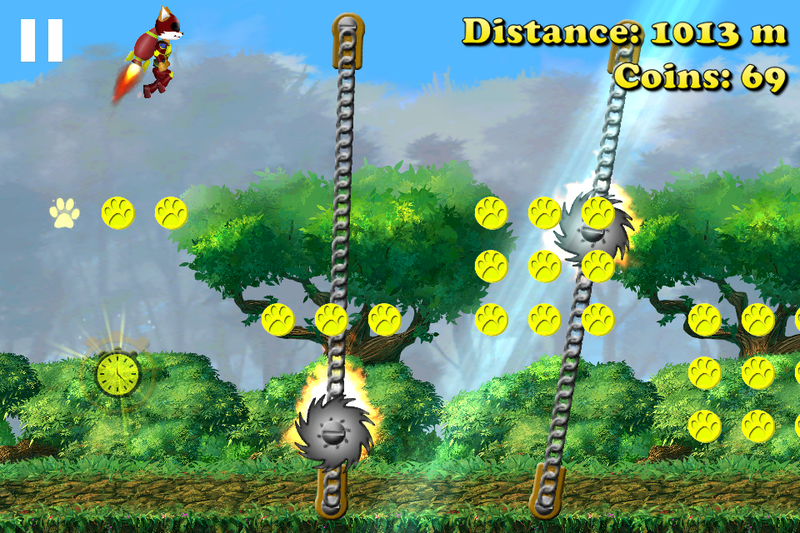 Some of these games are incredibly popular, like the chart toppers Temple Run 2and Jetpack Joyride, and others are more obscure, like Fox Tales: Rocket Run. The appeal of endless runners usually lies in their extensive upgrade stores, each failure nets you currency that you can use to make your next attempts easier. The more you play the farther you get, it’s incredibly addicting and a lot of fun. 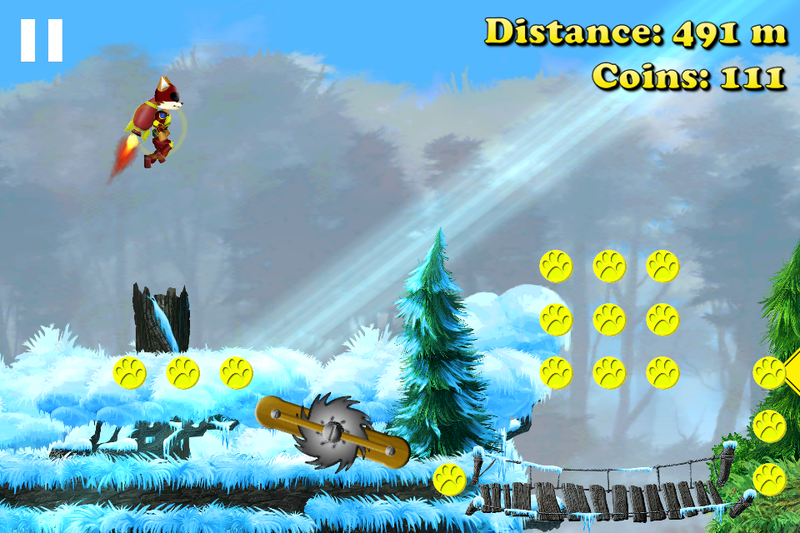 In Rocket Run, players control a constantly-moving jetpack-donning fox called Kizu, tasked with collecting coins while avoiding birds and whirling sawblades. There’s nothing inherently wrong with the game, but also nothing that inspires particular interest. The graphics are decent, they aren’t offensively bad, but they aren’t pretty to look at either. Meanwhile, the upgrade store is functional, but doesn’t really offer any interesting gameplay tweaks, simply making Kizu easier to control as you pour more coins into it. The audio design follows the same suit, the sound effects and sound mix are pretty bad, but the music is pleasant enough. Rocket Run does have a nice amount of bonus features though, with leaderboard and achievement support, as well as an always welcome implementation of Everyplay for saving and sharing gameplay recordings. All in all Fox Tales: Rocket Run is just ok, all the pieces are there for a solid game, but everything is just serviceable and nothing really stands out as particularly interesting. In a genre as crowded as the endless runner, that simply isn’t enough. Fox Tales: Rocket Run requires iOS 6.0 or later. Compatible with iPhone, iPad, and iPod touch. This app is optimized for iPhone 5. Follow Tapscape for the latest iPhone app reviews.